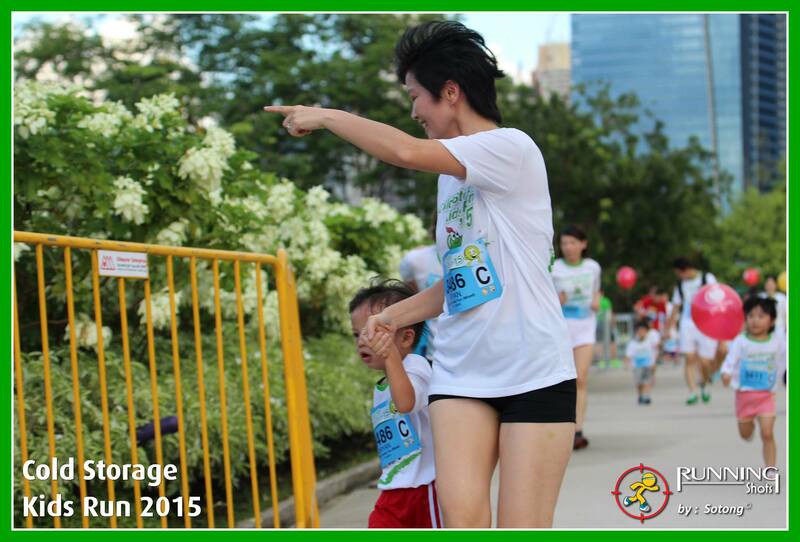 This year, B (mostly) ran his first 800m race at the 2015 Cold Storage Kids Run. Seeing him press on despite feeling hot and tired made me proud – and reminded me to persevere and not give up despite how we feel sometimes. Motherhood is kinda like that, isn’t it?! This year marks our fourth Mothers’ Day. Every time, I can’t help but thank God (again!) 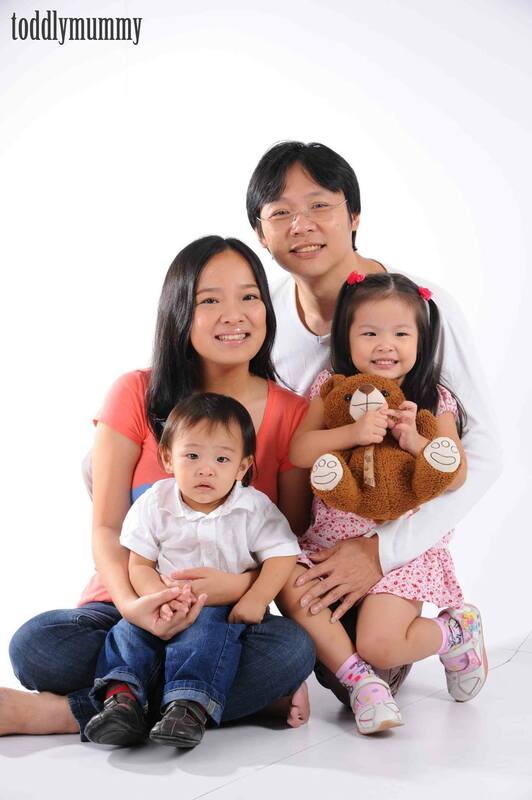 for B who finally made me a mommy – and provided the catalyst for this blog, Finally Mama. I’m all too aware of my imperfections as a mom but am glad that since I made my 2015 Chinese New Year resolutions, I’ve been able to find greater contentment this year at working full time, supporting CRIB, and being a mom to (just) one – adorable, amazing, appreciative, and at times, aggravating – 3.5 year old kid. What was inside was so simple yet awesome in its effort. B’s drawing and colouring isn’t great at this age. I know he wants to write and colour better, but I’ve been trying not to “correct” his grip and control, but rather let him keep scribbling, drawing, painting, clay and play doughing et al. 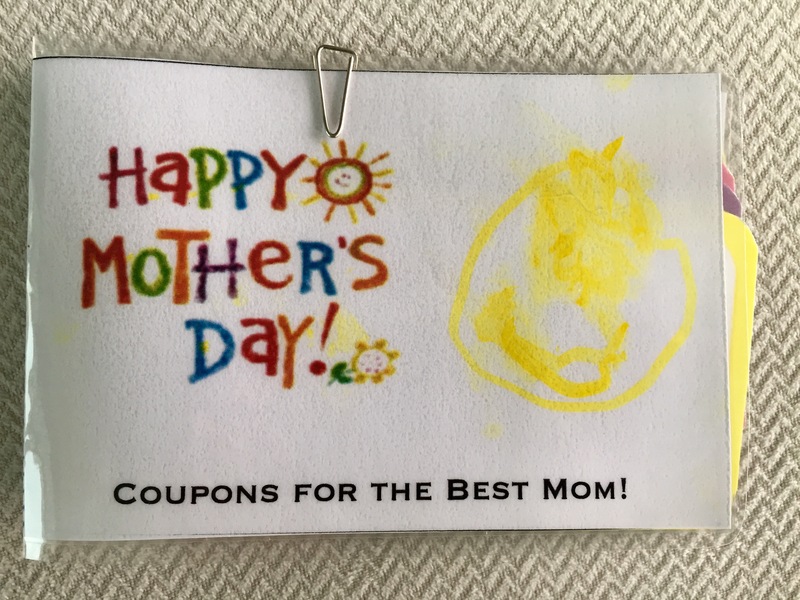 So, it touched me to see him try to write his name, illustrate each “coupon” accordingly (with his smiley faces) and colour the flower as best he could. Coincidentally on Mother’s Day, I also started to volunteer once a month at his Sunday School N2 class. Many (including the hubby) would argue that my schedule is packed as it is! But I just wanted to play a bigger part in his faith journey, support the regulars that put in so much effort to manage the kids while we attend the main service, and also spend a few more moments with him on a weekend, especially on weekdays when I’m away. Last but not least, this year, I also wanted B to appreciate not just mama but his grandma, as both grandparents have stepped up this year to help with chauffeuring and childminding. Daddy took B to a nearby nursery where he chose fresh carnations for each of us “moms” – mama, ama and nainai. Ultimately, what makes most happy as a mom are the spontaneous expressions of love and honest remarks that affirm the bond B and I have. Just as we love our kids through the ups and downs, so too do they love us despite our imperfections. And although we “older and wiser” adults should guide them as they grow, our kids often teach us wonderful lessons too – like ending a race well, no matter how tough the journey can be sometimes. 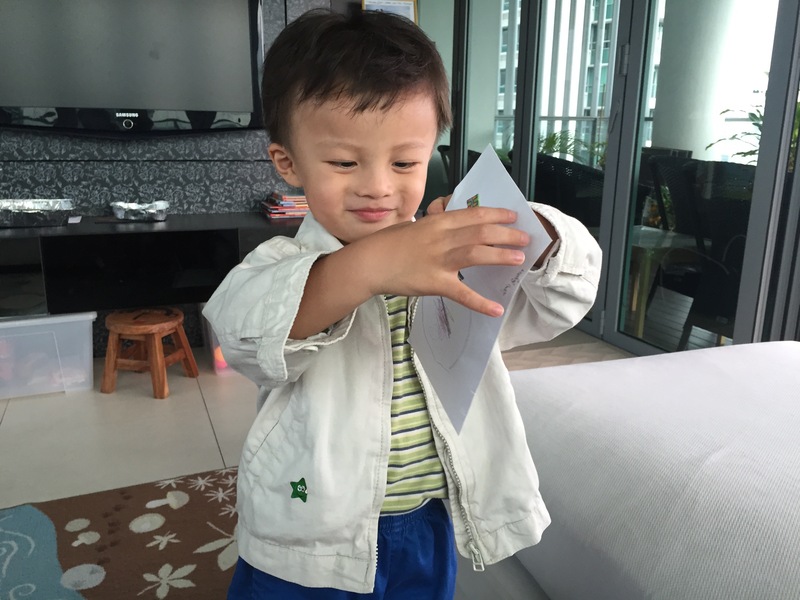 This post is part of the “Dear Mummy” blog train, a series of letters and dedications from our kids to moms. Next up is Winnie, who blogs at Toddly Mummy, where she shares her thoughts on parenting, and fun moments from their home learning sessions and outdoor adventures. She sometimes share about her favourite food too, along with occasional side orders of stuff that she finds useful as a busy mum. For updates, reviews and more, follow Finally Mama on Facebook or on Instagram. Previous PostTime is precious, waste it wiselyNext PostWhat else does a man need to be happy? I really love the coupons idea. 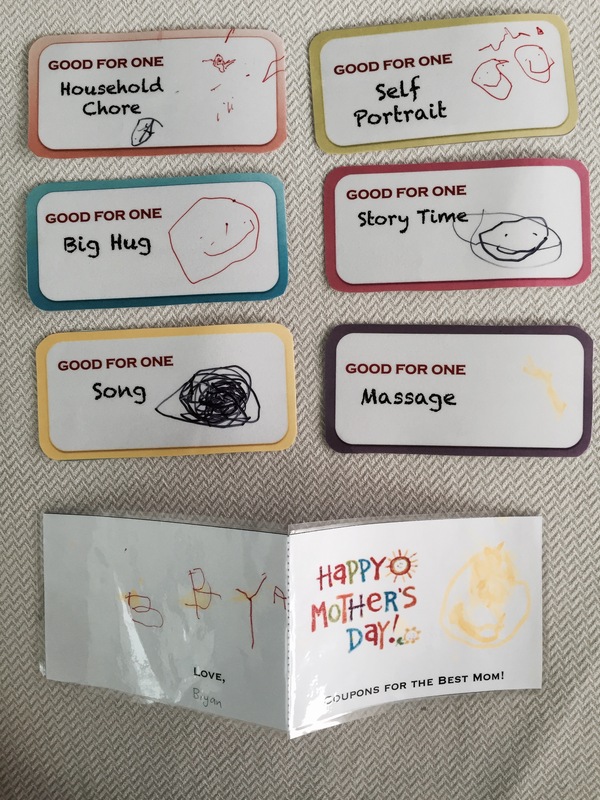 And the ice-cream stick craft with “World’s best mum” is cute too. I pray that as you take that step of faith, God will also grant you his grace and help when you most need it. Jiayou!